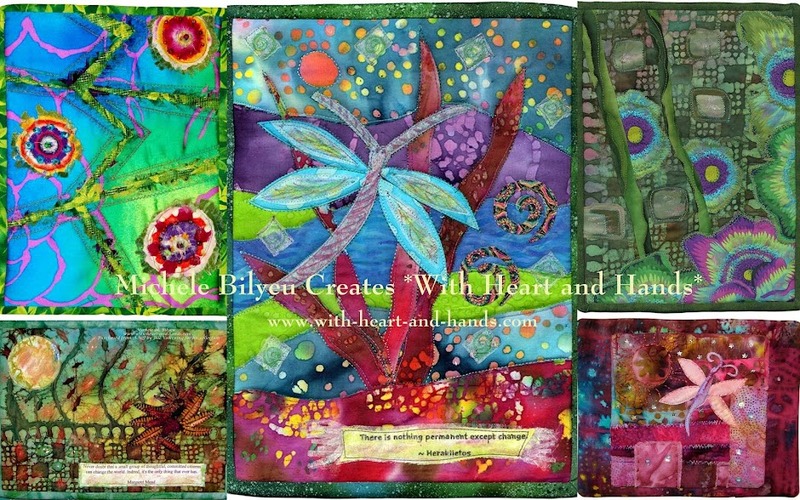 Michele Bilyeu Creates *With Heart and Hands*: Followers, Lots of GiveAways, More Prayers Needed! Followers, Lots of GiveAways, More Prayers Needed! The giveaway of my re-purposed books, patterns, and other quilty fun continues! If you haven't already entered please feel free to join in the abundance of my fun! I am so grateful and so honored that over 1,000 of you have taken the time to not only visit this blog but wanted to consistently receive updates by becoming 'followers'. It is unbelievable to me that over 3 million people have come here and read this blog. I feel so honored and so deeply grateful for all of this! 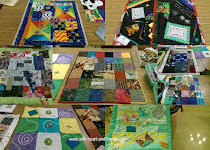 I started blogging in late October of 2006 as a way to connect with other quilters and it has grown, and grown and grown...as have I! I learned how to create a blog and added photos, and html links, and maneuver through so many trials and tribulations of blogging! It has been such a journey! And of course, the Internet has only become more complex and interwoven, as well. 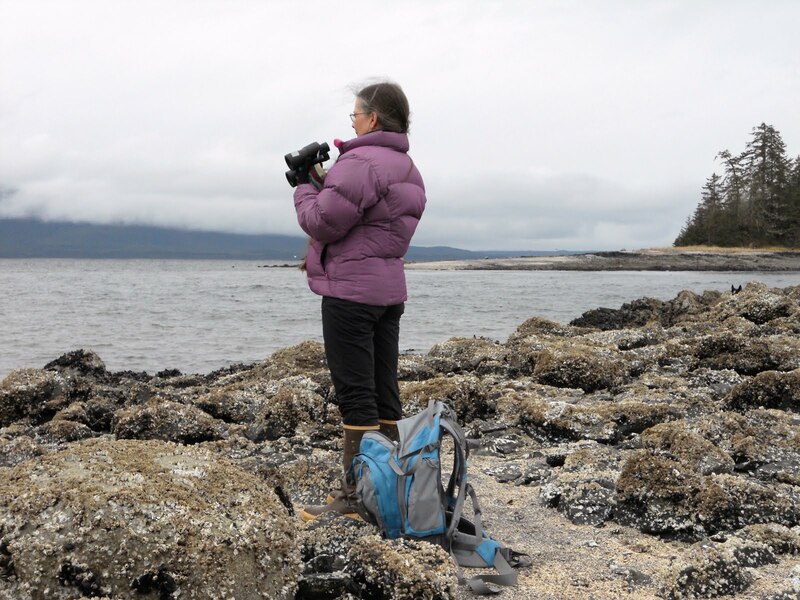 It grew into a journal of my life in so many ways, my process of my mother's survival from stage 3b of inflammatory breast cancer (by coming down from Alaska to live in Oregon with my family) to a survival that includes the discovery that she had now lived through cancer to then suffer from Alzheimer's Disease. It has been so unbelievably challenging, since we are in our 7th year of completely caring for her at home, and she is bedridden. But we do what we want, and need to and it is so hard on so many deep, deep levels but it has taught me, and moved me, and changed me every step of the way for the better! The more you give of yourself, from your heart, the more that comes back to you..not materially, but in far deeper and more wonderful ways! So, I only want to give back with what resources and what time I do have, to others! I am exceptionally thrifty and the current economic state of the our world only reminds me all the more of how connected we all are and how we need to look out for and take care of one another. So, reduce/reuse/re-purpose and if I have it and it's not being loved, or used....well, I'd rather share it with someone else and move the flow of abundance around! All of this was given to me, won by me, given by doing someone else a favor, or from a free table at my quilt guild and if I haven't used something in a year or more and aren't sure I will..I so want to share it with someone who will! Leave a comment on my last blog post if you are a follower..and yes, I don't mind if you become one, now...to have your name be entered in my list that I shall make connections to at least ten winners for some of these goodies. Please help me..if you see something you would like..just say what it is! Thank you also to all of you who have been spreading the word about Rebecca Savikko..my sister in law in Eagle River, Alaska who needs a donation of an O+ (but it has to be with high antibodies titers) kidney. And while you are sending positive thoughts, adding her to your prayer lists and chains (and yes they are all connected, as we are) please hold my brother, Doug, Becky's husband, in those prayers. After being very, very ill, and home from work for a week, my brother had to be rushed to the Adult Critical Care Ward in Anchorage with severe respiratory distress. He has bi-lateral viral pneumonia and has been put on a ventilator and induced in a coma to relieve the stress on his lungs. Antibiotics do not work on viruses, of course, so this is very serious and we need his overworked body (he has artificial knees, hips, and a rod in his back from previous injuries) and of course the huge stress over Becky. Oh, they so need our thoughts and prayers! And of course, for my dear friend of 40 years, Patti's son Kelly Ball, who continues in his second month of being in a coma after being hit by a car and suffering severe brain trauma. He is currently in a special care facility in Portland but his family would love him to show some signs of improvement so he could at least be moved down to Salem. He has opened his eyes and moved a finger and a toes. Life is filled with such worries and challenges. We focus on staying positive, we seek to find joy in our lives and we connect and share with others! Also to all of the Americans...Happy June 14th...Flag Day! Thank you all so much for your visits, your comments, and for just being you and adding so very much to my life, living, and this fabulous blogging and quilting world! My prayers for recovery and good health go out to your brother and sister-in-law...such a worry for them both! Sending prayers to your son's friend also! Michele, you are such an inspiration to me. You have mastered a way of channeling your energy into making good out of adversity. In the face of some pretty devastating circumstances, you forge ahead to make others' lives better. Thank you for being YOU. I lift you and your family in prayer. God is good! Sending lots of prayers and good thoughts dear lady! And a big (HUG) just for you. Oh, Michele. What can I say? My thoughts and prayers are with you and your family and friends. Michele-I am so sorry you are going through so much.My thoughts and prayers are with you and your family. I can tell from reading your post that your faith in our Father is very strong. Sometimes it may feel like you are alone, but He will never leave you. My brother told me once when I was going through some hard times,to put my faith and trust in the Lord and I would always make it through.And I have.Sometimes it is hard to do and I wonder why things have to happen the way that they do, But I know that He is in control and I believe everything happens for a reason. Stay strong and always remember that you are not alone.GOD BLESS YOU! Michele, I will add them to my list and hope for the best. From me to you and your family, a rain of blessings. It is monsoon season after all! Oh Michele you are definitely getting stretched thin with caring and worrying about so many others, that I do so hope you are remembering to take time for yourself and stay healthy!!! I am definitely sending positive thoughts and prayers out for you and all those on your prayer list. PS - I'm not leaving a comment in hopes of winning a prize, so please don't pick me. Just wanted to let you know I'm here and thinking of you, as well as trying hard to send positive thoughts and prayers. Thank you for the confidence you are showing your blogging friends in sharing your requests with us. I will be holding them in my prayers and thoughts..Also praying for you as I know how difficult it is when those we love and care about are so very ill. I have been a follower for a couple of months. I just found your blog but I know I have commented before. You are not alone. Positive thoughts and prayers are going your way. Michele, I love visiting you through your blog and seeing what you are up to with your "open heart and very busy hands". I enjoy your sage and very thought out posts and know you are a kindred spirit. Best thought and prayers are being sent to you and yours during these most recent trials. I am hoping and envisioning the actual best for you all. Oh and congrats on reaching 1000 followers, that's quite a milestone.